The Appleby Academy has been running in the Isle of Man since 2012 in conjunction with local charity Junior Achievement. It empowers students on the Isle of Man to become business minded over a 12-week programme. The winner of the Appleby Academy gets a paid summer placement, working in a number of departments across the organisation. The 2017/18 Appleby Academy student was Caitlin Collister, 18, former Ballakermeen High School student. Fresh from a 10-week spell at Appleby, she answers questions on the Appleby Academy experience and why Year 13 students should consider applying. What was it that attracted you to the Appleby Academy programme? I first heard about the Appleby Academy programme when a member of the Marketing team from Appleby and Sue from Junior Achievement came into school to deliver a talk during assembly. Immediately I was attracted by the opportunity to tackle a real life business scenario and the chance to showcase some of my ideas to the business community. 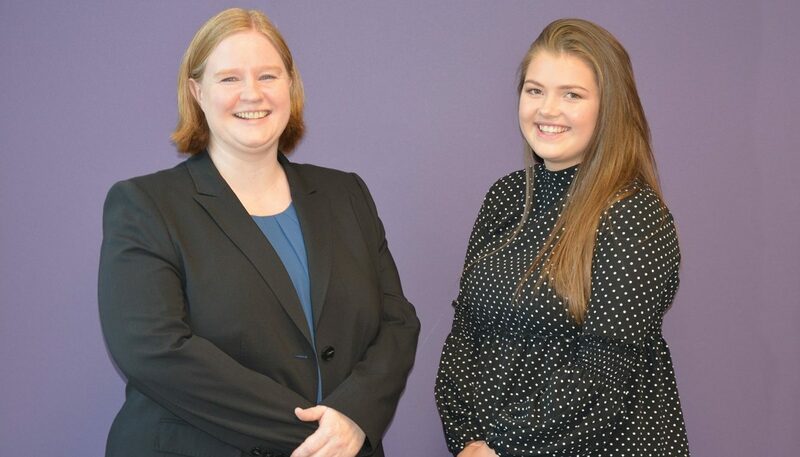 I also liked the idea of a paid summer placement, allowing me to begin to save money for university as well as gain work experience in an office environment, which is something so often required and valued by employers post-university. What did the 12 week application programme entail? Appleby ask you to create a proposal for a certain business scenario, so that you can evaluate a situation and come up with solutions. I chose a Human Resources scenario which focused on employee integration and morale. Once I had come up with my initial ideas, I then started meeting with my mentor to develop my proposal. Phoebe Harwood, from the Marketing team, was my mentor. Phoebe was always willing to make herself available to guide me and support me through the programme and my proposal. She gave me insight from an employee perspective as to how Appleby functions as a business, allowing me to include this within my work and develop my ideas based on schemes that were already in place. Having the support of a mentor was really important as it gave me confidence in my work. After I submitted my proposal, it was marked by independent judges within Appleby. My score allowed me to progress into the final, alongside two other Ballakermeen High School students. Once in the final, I had to create a presentation based on my report for a panel of judges within the business community. The presentation lasted about 10 minutes, and the judges asked me questions at the end. After some deliberation, I was announced as the winner. What did you learn throughout this process? I learnt how to use my classroom knowledge and apply it to a real life scenario, which I think will really prepare me for university and beyond. Additionally, I learnt how to pitch my ideas and present in an effective way, something that I believe will also be useful in my future career. How did you find your Appleby Academy summer placement? I really enjoyed my Appleby Academy summer placement, so much so that I extended the placement from six to 10 weeks. It was an experience that I am so grateful to have gained and would advise anyone else who is interested to apply as you certainly won’t regret it. The experiences I have had within Appleby have been so varied, which was one of my favourite things about the summer placement. I mostly worked in the Marketing department, but also had spells in Human Resources, Learning & Development and Dispute Resolution Law. I even managed to attend court one day, which was a unique experience! Appleby were brilliant in tailoring the placement to my personal interests, which made it even more enjoyable. Has taking part in the Appleby Academy been beneficial to you? Taking part in the Appleby Academy helped me boost my personal statement with the fact that I was shortlisted for the final. I was rewarded with an unconditional offer for my university of choice, something which I may not have had without my participation in the programme. The placement has also allowed me to gain vital work experience which can often be very hard to find and will hopefully put me a step ahead when applying for jobs after university. Would you recommend this programme to other students? I would definitely recommend to anyone who is interested. Even if you are unsure, contact Anna McChesney to find out more or speak to someone at school as it is such a great opportunity and has been a really good stepping stone for me between school and university. Alongside the money and the ability to put it on my personal statement, I would also recommend it just for the experience you get with Appleby. What’s next for you following your summer placement? I am going to university at the end of September to study Business Management and Human Resources at Nottingham Trent University. I can’t wait! To learn more about the programme and to download resources, visit the Appleby Academy webpage.